Prior to the canal’s digging, the northern portion of the bay between Minnesota Point and Rice’s Point—location of today’s Duluth Entertainment and Convention Center and Bayfront Park—was a marsh that included floating islands experts speculate were “caused by driftwood and accumulating vegetable matter.” Settlers C. P. Heustis and Charles A. Post platted Fremont Township on one of the larger islands, a chunk of land 1,200 feet long and 400 feet wide. 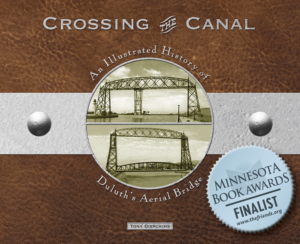 When the canal was cut, more than boats passed through. New currents created by the canal broke up the smaller chunks of land and swept many of the floating islands against the Point’s bay-side shore or through the canal and out to the big lake. 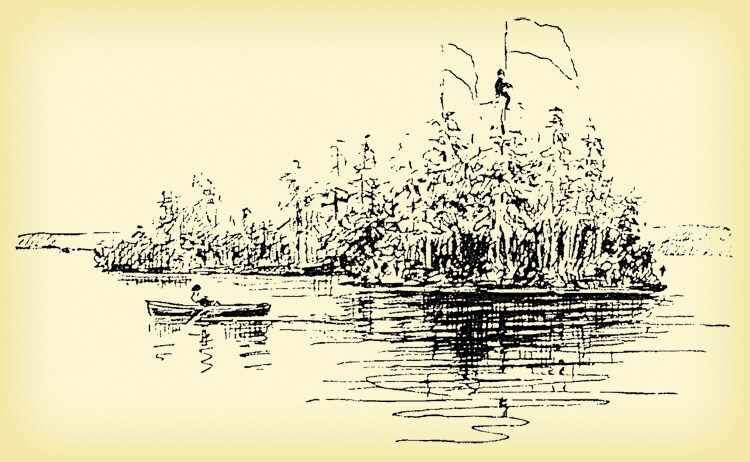 When Fremont Island itself broke free and passed through the canal in May 1873, Duluth City Clerk Walter Van Brunt, Bookstore owner Charles F. Johnson, and two others chased down the island in a rowboat (the sketch above was made by Johnson). When they caught up with the renegade chunk of land, one of them tied an American flag and a banner bearing the statement “First Clearance from Duluth, May 10, 1873” to the top of its tallest tree. They needn’t have bothered: that night lake currents drove the island against the Point, where it broke up. Material dredged from the canal and harbor to aid navigation was used to fill in this area in order to develop it commercially. In this same way, Rice’s Point and Minnesota Point were also made more substantial—neither sandbar was as wide then as it is today.